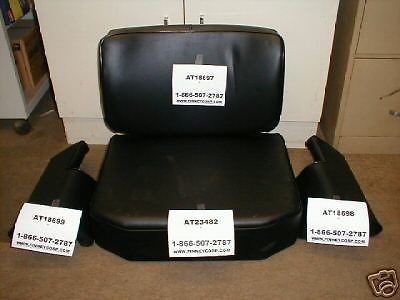 You are bidding on the back, seat, and two arm rest set for the John Deere 350 and 450 dozer and loader series of machines. This is only the cushions and the arm rests, it does not include the frame for the seat nor the brackets that the arm rests mount onto. 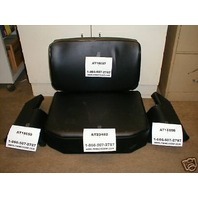 This is a four piece set including parts #s: AT18697 (back) AT23482 (seat) and AT18698 & AT18699 (arm rests) . This set also fits models: 350, 350B, 350C (loaders and dozers), 450, 450B, 450C, 450D, 455D, 550, 550A, 555, 555A. If you have questions, please call us for a parts diagram or information on your machine. This auction shows multiple quantities. When you bid, purchase a quantity of one and we will send the 4 cushion set. We will make available as seperate pieces upon request (if you only needed a single cushion etc). Also, EXTRA THICK ARM REST is available for $30 additional. Just email or call me if you would like this option. Not only will you get top quality replacement cushions if you buy with us, you will also save $$$$$ compared to going to your local dealer and paying over $500 for the same items. These are not made by Deere; however, in our business we use them all the time in machines that we refurbish. They are excellent quality and a perfect fit. Sometimes it is fun to make the Deere dealers look so greedy...we do it every day for our customers. Please note these dimensions: the seat cushion is 21 " wide and 16 1/4" deep. The backrest is curved and is aprox. 13" tall and has 4 bolts on the back. The armrest are aprox.14 1/8" and have 4 bolts on the back side. 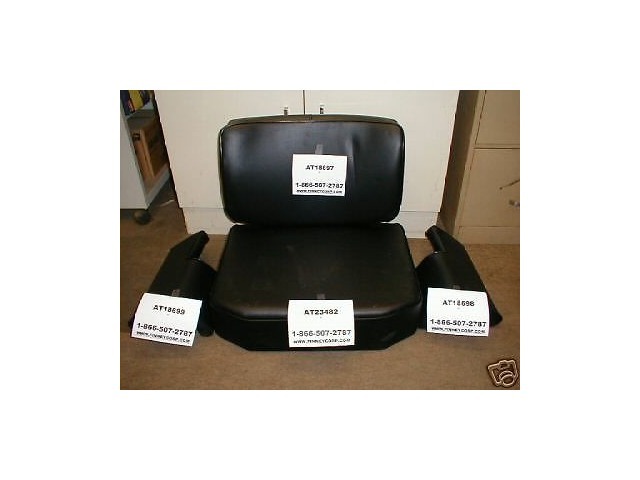 The seat set up does not come with the frame, just the Seat Cushion, Backrest and Armrest, Just take off your old and replace with the New.